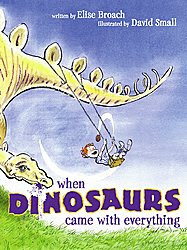 Hooray for the Association of Booksellers for Children for choosing When Dinosaurs Came with Everything as the 2008 E.B. White Read-Aloud Picture Book Winner. I just love, love, love this book. In fact, I loved it so much when I read it for the Cybils Book Awards, that I sent a copy to my 4-year old nephew for Christmas and he love, love, loves it too. Childrens' booksellers chose this title by Elise Broach and illustrated by David Small from among 43 picture books entered. The reading committee said it was the most highly recommended book on their list this year. "Just when a little boy thinks he's going to die of boredom from running errands with his mom, the most remarkable, the most stupendous thing happens. He discovers that on this day, and this day only, stores everywhere are giving away a very special treat with any purchase." read more here. If you are looking for a fun, imaginative story to read with little boys in particular, I highly recommend this book. And kudos to the childrens' booksellers for choosing such a great title as their 2008 winner. By the way, childrens bookstores are by definition independent, so support your local independent book stores!